The Strawberry Defined Oregon. But Is It Going Away? The Oregon strawberry may get squished by sturdier competition from California. Maria Gonzalez grasped the stem of a ripe Puget Crimson strawberry under a steady drizzle of June rain. With her thumb and forefinger, she pinched the stalk above the strawberry’s cap, breaking the stem. It was the third week of Oregon’s 2016 strawberry harvest—a 20-week window that started in mid-May and will trickle into October. On this morning, the rows of berries at Anahuac Produce, a small farm in Molalla, were still cool an hour after sunrise, leaving the stalks firmer and easier to break. Bent over the plants, Gonzalez, 25, picked with one hand until it was full, then gently tossed the berries into a bucket, careful not to bruise or crush any of the fruit. The latex gloves she wore to keep the juices from staining her hands were spotless. The Oregon strawberry is a fragile treasure. It’s fire-engine red, bursting with flavor, and sweeter and juicier than berries from anywhere else in the United States. But the Oregon strawberry wasn’t built to last. It’s highly perishable: The Hood variety, Oregon’s best known, needs to be sold within one day of picking during its three- to four-week season before shoppers will reject it as too ripe. And it’s getting crushed—because California has built a sturdier strawberry. In 1988, Oregon’s strawberry harvest hit its all-time high of 100 million pounds. Since then, strawberry production has dropped 85 percent to about 15 million pounds in 2015. A crop that reaped $31 million in 1988 now generates about $13 million a year. Our southern neighbor has muscled Oregon growers out of much of the domestic market even as American consumers’ demand for fresh strawberries has quadrupled since 1980. While Oregon’s harvests have shrunk, California’s have grown to more than 2 billion pounds a year, up from 725 million pounds in 1987. Today, nine out of 10 U.S.-grown strawberries come from California. California gobbled up Oregon’s share of the strawberry market by fulfilling the growing public demand for fresh strawberries from cheaper plants with a higher yield of tougher berries that travel better. California strawberries can travel and sit on grocery-store shelves 10 to 14 days after picking without spoiling. The only thing Oregon strawberries have left going for them: They taste better than strawberries grown in California or anywhere else in America. Nora Antene, a celebrated Portland pastry chef now at the soon-to-openrestaurant Tusk, on East Burnside Street, says she uses only Oregon strawberries because the flavor is sweeter and more complex than California’s. “They’re more like strawberry candy,” she says. That may no longer be enough. The decline of the Oregon strawberry represents a trend that vexes this state in other areas of its economy and culture: What grows in California changes Oregon. The Oregon strawberry is doomed to become a niche product—the vinyl record of fruit—unless someone can find a way to build a better berry. The moment a strawberry is picked, a race against the clock begins. Under snow-capped Mount St. Helens looming in the distance, Hood strawberries stretch across a field on Matt Unger’s 143-acre farm in Cornelius. A lane of straw separates each row of plants, placed by hand to protect the berries from splashes of mud when it rains. Mini carts, narrow and low to the ground, aid the workers, who crouch on bended knees as if to offer a marriage proposal. They sweep their hands quickly over the strawberry bushes, brushing aside leaves and looking for hidden clusters of berries. There is definitely a technique to their labor. Hood strawberries have dense foliage and relatively small berries, making it harder for workers to find and pick the berries. Each berry’s cap is left intact because the caps make the berries look better and extend their shelf life. It’s better to pick in the morning, when the plants are cool and easier to snap and the berries don’t turn to juice in workers’ hands. A fast worker won’t grab just one berry and toss it in her pallet. She’ll grab four or five per hand before taking the time to drop them in. And before she does, she’ll review the berries in her hand, putting the best berries in one box and tossing bruised or damaged berries in a separate pile that Unger Farms will sell for juice concentrate. In 2012, according to the Oregon Department of Agriculture, strawberries bound for the processed market fetched 58 cents per pound, compared with $1.39 per pound if they were going to the fresh market. The Ungers have developed an elaborate system to keep their berries cool in the afternoon before they’re shipped to grocers. To make sure the Hoods stay plump-looking and bright red, they’re trucked out of the fields as soon as workers pick about 180 boxes. They’ll immediately be put in front of huge fans that cool the berries to about 35 degrees, then placed in a refrigeration room, where they’ll sit overnight waiting to be delivered directly to customers like New Seasons Market the next day. But that’s the kind of sophisticated operation and delivery system most strawberry farmers—who operate on thin profit margins (see “Getting the Juice,” below)—don’t have. Oregon strawberries command a huge following because of their intense flavor and rich red color. “Oregon grows very high quality fruit and the environment is perfect for that internally red, sweeter-tasting berry that you don’t necessarily see coming from other regions,” says Julie Pond, a crop consultant. Less than 20 percent of Oregon strawberries arrive fresh on grocery shelves. The rest are processed, meaning they’ll be frozen or turned into flavors for yogurts, jams and ice creams. That’s long been the case in Oregon, where warm days and cool nights produce a berry that’s sweeter and redder than berries grown in warmer climates. That means products that use Oregon strawberries have more intense flavor and use less coloring. As strawberry production has declined in Oregon, the split between processed and fresh berries has shifted slightly to fresh berries that fetch higher prices and command a local following. In 2000, 33.5 million pounds of Oregon strawberries entered the processed market, while 1.8 million pounds were sold fresh. In 2014, growers processed nearly 13 million pounds of Oregon strawberries and sold 2.5 million pounds of fresh berries. In California, the split is the reverse. Eighty percent of the state’s 2.75 billion pounds of strawberries in 2014 went to the fresh market. But here’s the rub: The small percentage of berries that California shuttles off for processing—more than 500 million pounds of strawberries in a given year—still dwarfs the 13 million pounds Oregon produces for the same market. Jeff Malensky knows that math intimately. Malensky, a third-generation berry processor, operates Oregon Berry Packing , which takes strawberries from the field, slices or freezes them whole in 30-pound pails for shipping in the U.S. or abroad. He says his family business in Hillsboro is still packing strawberries for one reason: Japanese ice cream. One of his biggest clients is the Japan branch of Häagen-Dazs, whose recipe for strawberry ice cream depends on the Totem variety of Oregon strawberry, he says. “Without them, I don’t know where we’d be,” he says. Malensky says some customers still demand high-quality berries, even though Oregon growers struggle to scale their operations to compete with California’s cheaper product. What makes California so much better at growing strawberries? The first answer is climate. In much of California, farmers enjoy warm days and cool nights, the perfect combination for strawberry-growing. Unlike Oregon, which enjoys a roughly four-month strawberry season, California can grow strawberries year-round. The second reason: science. Mega-suppliers like Driscoll’s in Watsonville, Calif., have funded their own research, and growers fund more at the University of California, Davis. That work has helped California boost its plants’ yield to seven times what Oregon’s bushes produce. California growers also plant strawberry varieties—Monterey and San Andreas, for example—that produce big berries with less foliage so they’re easier for workers to pick and cheaper for farmers to grow (see “Strawberry Shorthand“). Does California at least acknowledge Oregon’s strawberries taste better? Not exactly. It’s Chad Finn’s job to find a better berry for Oregon strawberry growers. At his U.S. Department of Agriculture lab at Oregon State University, he has been pursuing that quest with other berry researchers since 1993. “If we had a perfect blend, it would put us out of a job,” he jokes. Finn has had some successes, including the Tillamook, a berry released in 2004 that is now Oregon’s most commonly grown strawberry, eclipsing the Hood. Workers love it, Finn says, because the plants produce big berries that are easier to pick and can last four days. Workers can also make more money when they’re picking five berries per pound compared to 10 berries per pound. He’s been pursuing that ideal for 22 years—and still doesn’t have a strawberry to compete with California. Americans are eating more strawberries now than ever. But the growth has happened almost entirely in the fresh market, where Oregon has failed to compete. The average American ate 8 pounds of fresh strawberries in 2013—up from 2 pounds in 1980, according to the USDA. Demand for frozen strawberries has hovered between 1 and 2 pounds per year over the same period. Those trends worry Malensky, the Hillsboro berry processor. “I don’t know if we’ll have a strawberry industry in five years,” he says. Even the state’s biggest cheerleaders for Oregon strawberries have trouble predicting the berry’s future. Recognizing the demand for fresh fruit, some Oregon farmers are switching to blueberries, which Oregon growers can ship internationally, thanks to their four-week shelf life. As California seeks to increase its advantage, Oregon strawberry boosters wonder how many harvests they have to look forward to. “Oregon has always ridden on the idea that our berries are redder, sweeter, more delicious,” says Barton, a retired marketer with the Oregon Department of Agriculture. “People want fresh berries. Well, guess who does fresh berries? It’s California, and they grow thousands of acres of them. As California improves their flavor, what do we have over them? 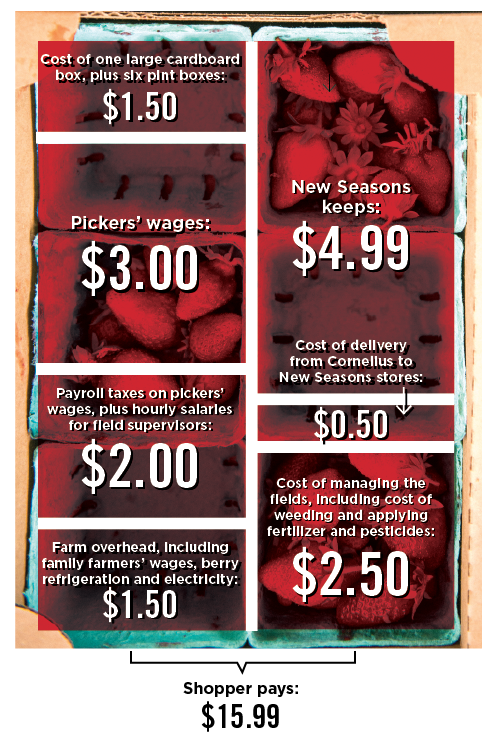 The profit margin for Oregon’s strawberry growers is nearly as narrow as the window when their fruit can be eaten fresh. Let’s say you buy a half-flat of Hood strawberries from Cornelius’ Unger Farms, sold at New Seasons Market for $15.99 starting in mid-May. A half-flat is 6 pints of strawberries, or about 5 pounds. https://www.islernw.com/wp-content/uploads/2016/07/oregon-strawberry.jpg 321 855 IslerNW https://www.islernw.com/wp-content/uploads/2013/12/header_logo_trans.png IslerNW2016-07-19 21:54:542016-07-19 21:54:54The Strawberry Defined Oregon. But Is It Going Away?